Smile is the best accessory. Those Italian man … always elegant wherever they go! Lino who looks like a Lion. What a spectacular looking man. I admire this man’s sartorial choices! Always sharp and well-turned out! Very nice picture, he has a classic style. I love his cheeky smile, and the super fine subtle blue pin stripe in his coat – both make the whole thing come alive! Gotta love the free flip phone and $20,000.00 Patek paired together. Classic! This man looks like the epitome of a gentleman. He looks so well composed. I love the DB suit. I also really like his tie. Mr. Fabulous. Love the non-shiny tie + perfect colour combo. I never thought on this material for this piece of cloth. Wow! Check this guy out! Love his personality. :) I like the stripes in this gentlemen’s outfit, & the calming harmony of the grey/taupe with blue! One of the best dressed men in the world. Perfect! I think Lino has my vote for being on the cover of The Sartorialist 2!! 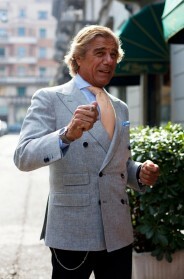 This men has all the characteristics of the Italian men: happy relax with great outfit. I hope that I can look as stylish as this gentleman when I grow older. I love the collar of his shirt! Love his elegance, his smile, his light! What’s with the number 7 on his tie? Such confidence and class. Beautiful attire and a wonderful smile, both can take you far. I wish more men dressed like this. I was operating under the assumption that Lino referred to the material (linen.) Apparently Lino is this fellow’s name ? And love the look, although the 7 on the tie seems unnecessary and overly fussy and detracts from the harmony of the outfit. Also, the “free” flip phone is probably not free as Italians have yet to embrace the smart phone as we have in the US and still do very little texting – most they talk, which is understandable given they’re Italians. Lino is a pro at Sartorial Elegrance! Love the Patek and the bracelet on his other wrist. Great picture! 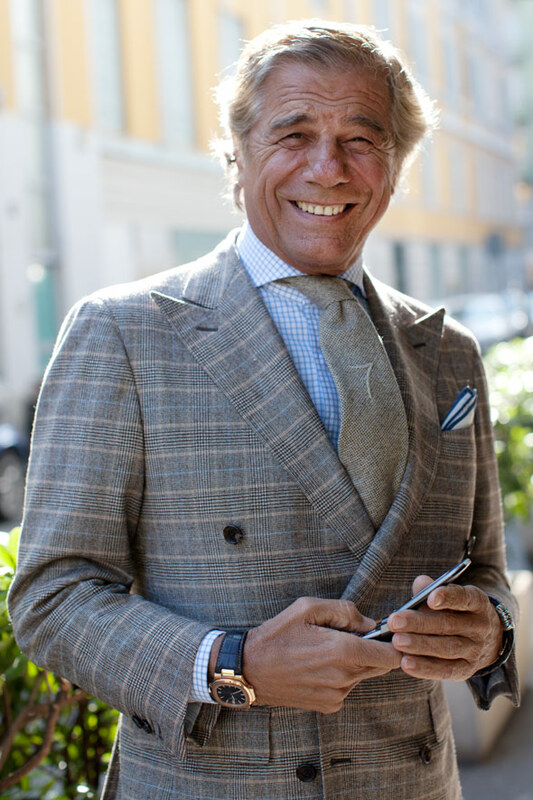 Love double-breasted suits, specially for men over 50. Love this photo. Totally one of your best! You can see that his smile is real. And boy… His outfit is just awesome! He looks like a nice men. Does the 7 on his tie mean something? Wow, that gold Patek Philippe really sets it off! Lino just rules, doesn’t he! 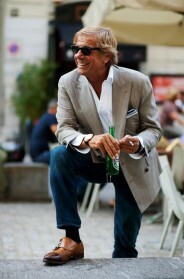 Middle age style at its best and a common subject of the Sartorialist’s lens! Grey Fox – man searching for style in middle age. I absolutely love light colored outfits!! this one is just perfect! So very Italian! Great photo, great style. Love it! I love this Lino lion’s smile, his pocket square, his shirt, his watch…how beautifully his jacket is tailored…and his hands. LOVE his hands. What a delightful man. He has excellent posture. What a dashing older man! That suit is rich and opulent. It’s sure, it’s an elegant italian gentleman! WOW! What a stylish man! Loving the look! Somehow his smile made me smile too! I love every shot you have taken of him, great style!!! I totally agree with Gerhard, South Africa. Lino for the cover of book 2. He personifies and exudes the joy of style and fashion. Fantastic idea! Just love this sartorial outfit. Very stylish!! Love the tie, and the smile! What a great picture – it’s really uplifting! – What a great face and terrific lapels! Lino always puts it together. Love the Patek! Esa sonrisa es preciosa. Lo demás es accesorio. Love seeing him. The camera loves him too. He is a natural; You can tell he loves clothes. Great pattern mixing. Notice the smaller check shirt with the bigger Prince of wales check sport coat. The texture of I bet his cashmere tie. This is real style. And he makes it look effortless. He has his own signature style. People are asking what the seven means on his tie. It is his signature style. Truly one of the best dressed men. What a handsome man! So italian… Lino looks great! Love his smile. He’s watch is Georgeous as well. Love this suit ! Respect ! I have to agree with the comments above: what a great smile! Lino is so stylish!! Great smile as usual! Some of you asked about the tie; the number seven simply represents the lucky number. Fantastic man! Be sure to visit his store, Al Bazaar, when in Milan. It’s an interesting and refreshing jump into a narcissistic era. Such a happy-about-oneself knowingly smile, in its unpretentious and bordering-with-being-silly ingenuity, releases the tension of these years depressed by ugly crises. Stylish, for sure, but I’d prefer a little more elegance and a little less bombast. Still, we could all only hope to look half as good as him at his age! Lines always make you more interesting. With a smile as cutaway as his collar, very handsome man, very nice shot! Classic style in an italian gentelman…Love it! Sorry, but for me is a little bit over dressed. Lino is an inspiration. I am fortunate to call him a friend and can tell you that his style is only overshadowed by his grace and kindness. The man certainly went down the accessory checklist: watch, bracelet, pocket square, smile. Super sharp. What a wonderful style / smile combo! Beautiful smile. It makes perfect this photo. what a face!!! this can only be earn with years of happiest,,, and so many shot there faces with botox,,,, take a lessons here,, wrinkles and still laugh at time!!!!!! Italian men style , the best!!! I usually comment on the great smiles I see on the women who show up here. But men can have them, too, and Lino is one of the best examples. His smile does nearly as much for him as his choice of clothing. Simply outstanding. Especially love the Nautilus. Looks so much better than those gigantic watches imo. Lino smiles, Lino is elegant, Lino is italian. Italian’s do it better ?????? As usual……. Lino is the number one! This single photo demonstrates how men’s fashion can be very exciting. I love the DB jacket: The peak lapel and working cuffs are excellent as is the check pattern. I like the number 7 on the neck tie, perhaps a bit large, but it has made me wonder who this is the creator of this wool necktie. I think the shade is perfect and works well with the blazer and the watch. Inimitable Lino, the most elegant italian man! Bet he has some good stories! Such a wonderful charismatic picture and his style is perfect. I too, would smile like the sun if I were so beautifully dressed! I love every photo you publish of him. His radiant confidence is refreshing. I think I’m in love! This man is so stylish and he looks so happy too. This has pretty much brightened up my whole day! hahaha elegant Italian Aldo Maccione!! Love it! Oh, BABY! He’s really got it ! Proof that looking good makes one feel good. And it makes me feel good to feast my eyes on such style. Props for a man who enjoys looking his best. His smile makes the whole photo! I love the shirt and jacket print mix. so beautiful. Great look and I’m loving the 7 in the tie. Lino is great and creates styles, just like the 7 tie he is wearing in the picture. In my style profile of Lino Ieluzzi I explain how it all started. Dripping with class and sophistication! i find the whole thing atrocious, not least the fact that that jacket looks uncomfortably tight. But I’m much heartened by people’s love of people in all other comments. And glad the man is so happy.